You could be forgiven for thinking of Hizri Ismailov as a godfather. It’s in the way the Dagestani entrepreneur communicates with subordinates with a nod of the head, his penetrating stare, the lurch of his chin, the lifting of the eyebrow, the kind-but-curt one-word answers. His subtle mannerisms belie the enormous influence he holds over those surrounding him. In a country not known for its customer service, waitresses trip over themselves to keep his glass filled with dry red Saperavi wine, heated to 30 degrees Celsius, not colder, not hotter. His security detail scrambles to keep up with his unpredictable movements, taking great care to stay as invisible as possible. Hizri prizes his privacy. And then there are his digs: namely the newly opened Pub 512, which is situated on a dimly lit backstreet in Kaspiysk, a bedroom community on the Caspian seaside outskirts of Makhachkala. When I first visited, one mild September evening last fall, I was distracted by a posy of Dagestani fat cats posted up at the booth next to mine. Their bodyguards waited impatiently at a booth across the way, with two AK-47’s and an Uzzi pointed straight at me. But Hizri did not give the guns a second glance. He had been waiting a whole year for this moment. And so had I. At the end of 2012, Hizri brought me to the pub when it was yet a drab, unpromising construction site littered with rickety scaffoldings and unfinished walls. Dressed in his signature midnight blue Italian jeans, and a suede maroon Parisian dress shirt under an ebony velvet sport coat, he spoke with glee about his plans. “Glee” for Hizri means a wry smile shooting across the day-old stubble of a well-groomed, handsome face (despite a scar across his upper lip), and radiant hazel eyes lighting up in a flurry of excitement. The good news was too good to believe. There was not a single Western food establishment around. 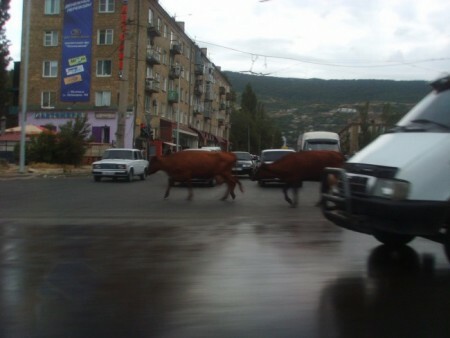 Dagestan remains one of the only populated regions in Russia without a single McDonald’s. But Hizri announced that he wasn’t planning to open just any second-rate café or fast food joint. Rather, he was planning a “real American pub.” The more we talked, the more I realized that what he really meant was an American steakhouse. I couldn’t believe it: steak in Dagestan? His claim was so incredible as to border on an insult for a Westerner who has lived for four years in this place, steak-less and without access to Guinness. Local cuisine remains a mix of boiled dumplings, hunks of lamb, and garlic sauce – along with the peasant’s fare of traditional Russian influence – salads, soups, breads, and pickled everything. Dagestan’s ignorance of steak results from many centuries of isolation. A year later, in a gesture of ‘I told you so,’ Hizri ordered four steaks for the two of us – a Ribeye, a NY strip, a T-bone, and a Filet Mignon, all grilled medium rare. Washing it down was a fresh pint of Guinness, on tap. Twenty feet away a Russian woman in a sable, sparkling cocktail gown crooned to the live accompaniment of a saxophonist. Between songs, the restaurant’s smoky interior filled with familiar American accents of commentators and performers on Sky FM radio. I was still concerned about the loaded automatic weapons pointed at me and my mouth was admittedly full and yet that was not the reason I was speechless. Pub 512 is just the latest in a string of business ventures that have begun to transform this side of Makhachkala. Hizri’s Georgian restaurant, another first in Dagestan, just opened its doors a few weeks ago. An Italian café and a seaside hotel complex are in the works. Hizri’s certainly not the richest man in Dagestan, not by far. Nor is he all that powerful compared to the real Mafiosi of this place. But it’s precisely due to individuals like Hizri – these deep-souled, far-sighted entrepreneurs – that Dagestan keeps from becoming a failed state. Hizri is a genuine fighter in his world, a concentrated cultural warrior, not a calculated thug. His Avar forefathers wielded swords; he prefers pubs. He’s busy combating terrorism and unemployment – the twin scourges of Dagestan – one café at a time. His battle is blood-earnest. At stake is the soul and future of Dagestan. Not to mention his own life. Hizri was born in rural Dagestan, in the Avar-speaking mountain village of Kutusha in the spring of 1964. His birth certificate says May 1st. But his mother insists it was sometime during the last week of April, meaning he’s always enjoyed the privilege of celebrating his birthday for an entire week. His wry smile reveals a palate of milk-white teeth that contrast sharply with his shock of black hair, cropped neatly, not long or short. His appearance might strike you as Italian. Life in the mountains bred toughness. His family endured the hardships of poverty and remoteness like their neighbors, though Hizri didn’t consider his lot disadvantaged at the time. The Avar culture in particular, as old and rough as the Spartan’s, raises boys to be warriors. Hizri’s father forced his sons to sleep on the floor in the unheated veranda of their mountain home “to,” Hizri says, “make men out of us.” In a spirit of cunning, not of defiance, Hizri discovered a resourceful method of warming up his sleeping quarters. Each night, an hour before bed, he forced the family cat into his sleeping bag and zipped it shut. Hizri went to a university deep within Russia proper, near Moscow. Unable to make ends meet with a hard-earned degree in architecture, he finished his degree in Dagestan in 1993, then spent nearly a year recovering from an illness attacking his heart and joints – something he inherited from his father (along with mathematics acumen), who had died when Hizri was sixteen. Thoughts of his own death exerted a reviving influence on Hizri. He found a new ambition for life within the drab, sterile halls of the old hospital. A curiosity for business was born. These were the wild days of economic free for all following the collapse of the Soviet Union. Regional volatility added to the fray, as neighboring Chechnya went to war with Russia, and newborn nations to the south (Azerbaijan, Armenia, Georgia) were engulfed in various conflicts. Instability reigned. In the mid-90’s, after crimping every kopek he could as a local truck driver, Hizri had saved just enough to open his first business – a modest, post-Soviet kiosk at the edge of town. It looked like a glorified New York hotdog stand. Inside, Hizri sold nondescript soft drinks, chewing gum, AA batteries, strike matches, salt, sugar, flour, cooking oil, American candy bars, Russian cigarettes, and bread. Bread became Hizri’s silver bullet. The young, struggling businessman bought fresh bread wholesale from a nearby bakery and sold it without a profit, as a mechanism of drawing in more business. He also included a shiny bread bag free of charge – taking a financial hit to do so. While other retailers scoffed, the calculated risk paid off as customers flocked to Hizri’s stand. In less than a year, Hizir’s corner booth had amassed its first significant capital. He views with utter seriousness, even today, how crucial that decision was – what to do with that first $9,000 of profit. Marshaling unknown powers of self-restraint, he resisted purchasing a car and a dozen other niceties. Instead, he immediately reinvested the capital into his store and expanded, even though that meant many more months living a like a pauper. The ripple effect of that one decision can be seen today across Dagestan in the torrent of new businesses Hizri is opening, as well as in the waves of well-paid employees enjoying a better life. Unlike the Lexuses and Mercedes that the typical godfathers of Dagestan drive (and there are plenty of competing godfathers here: think Chicago in the 1930’s or Sicily in the 1970’s), Hizri drives a new Toyota Camry. He takes time to exult in the fuel economy and reliability of his purchase, in a gesture far more civilian than gangster. If I thought the Camry was a modest vehicle for a man of Hizri’s ilk, I was shocked to hear of the village boy’s very first journey out of his mountain village and down into the coastal capital city at age 17. He hitched a ride in the back of a covered lorry. Roughing it over treacherous roads, the discomfort experienced by his limbs and posterior surpassed only by his difficulty breathing while in the dust-blinding and oxygen-depleted truck bed. The crude transport experience, however, took only half a day. When he disembarked into the bustle and beauty of the city, he experienced an Aladdin-like trance that has endured for more than three decades. Hizri’s base of operations is on the top floor of a newly constructed five-story shopping complex in the center of town. 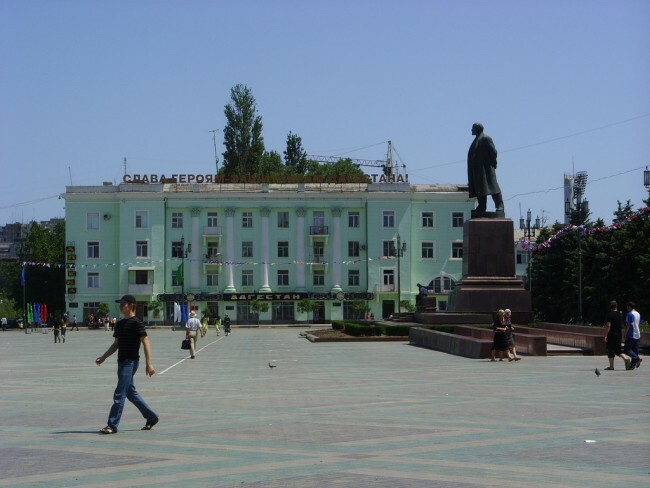 The mall, one of nine businesses owned by Hizri, is the nicest shopping center in Kaspiysk. Nowhere as large as a typical Western mall, it nonetheless boasts an escalator, an Ecco shoe outlet, a Western Union office, an international tour agency, a cosmetics floor peddling name-brand fragrances from France, and a European gift boutique. The place is bathed in marble and glass and feels more like a miniature Louvre than a Mall of America. I was imagining something Lex Luthor-esque, straight out of a Marvel comic strip. Instead I found the office warm and humane. Two local portraits — one a bright panorama of 19th century Georgian village life, the other of three rural Dagestani women treading a hand-woven carpet and carrying water in ancient copper pitchers — hang on opposite walls. There is a deliberate tension between these two centerpieces. Today’s Dagestan retains the tradition and patriarchy of the women’s portrait, while the luster of the free and flourishing society fast ebbs away beneath the threat of Islamist insurgency and a reactionary government. In addition to the paintings, the office houses various curios from Hizri’s travels to Portugal, Italy, England. Hizri’s thirst for world culture and the arts can drive others batty, not unlike Peter the Great’s pro-Western frenzy centuries before. On one occasion, fifteen years ago, when Dagestan was under threat from Chechnya and on the verge of all-out war, Hizri confused friends and onlookers by his seeming oblivion and furtive obsession with hand-sculpting an elaborate fountain outside one of his new café. He was, he told me, sure the café would soon be destroyed, but he had to finish the fountain. Better to gaze upon it for a few days than to have never seen it at all. If it seems incongruent that a godfather could be an artist, you must remember that these Caucasus Mountains are fabled as a land of warrior-poets. For centuries, travelers have noted this mesmerizing combination. Even among the roughest and most uneducated mountaineers, there remains a protocol to life that feels profoundly poetic: the precise way men are greeted according to age and status; the particular manner in which tea is prepared and consumed; the endless, longwinded, emotionally belabored toasts during feasts. These wily mountain warriors are as ready to drop everything to dance a carefully choreographed dance as they are to produce a dagger or gun. Such an environment seemed worlds away in Hizri’s office. Hulking men sat comfortably on leather armchairs in the office, sipping expensive Indian tea out of silver teacups. I listened in wonder as Hizri and his buddies praised the comparable stability and peace of today’s Dagestan, despite ongoing issues and threats and violence. The wars in Chechnya were over; the conflicts to the south were over. A dove calmly cooed outside the seaside window. Another large painting in Hizri’s office, this one above a leather sofa, caught my eye. A zebra, whose stripes quickly struck me as a symbol for Hizri himself. For all is not black and white with the godfather. He possesses a degree of shadiness on the order of a local Robin Hood or Robocop. I personally witnessed one situation where distraught parents with poor connections arrived at his office for help. Their son had been attacked by a drunken man on the way home from elementary school. Feeling the inability of local authorities to handle the situation sufficiently, they sought out Hizri for advice. They found justice instead, as Hizri’s guys were sent to find the culprit and “teach him a lesson”–not lethal, but one he’d never forget. 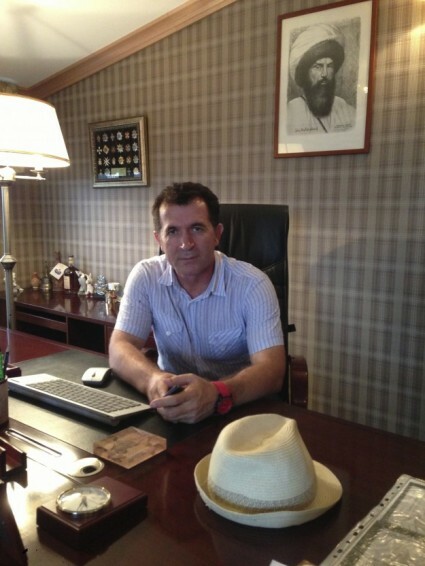 Squarely above Hizri’s polished, mahogany desk hangs a portrait of this 19th Century revolutionary leader who led the Dagestani and Chechen peoples in a quarter century of armed resistance to Imperial Russia. Imam Shamil was an ethnic Avar, just like Hizri. There’s no intended analogy, he stressed repeatedly. Yet as he lauded the great imam for being a noble, self-made man who yearned for freedom and justice, I couldn’t help but think that I was looking into the soul of a modern Shamil. Hizri, however, loves Russia. He deeply appreciates the countless, mountainous improvements in infrastructure, education, culture and economy achieved by Russia in the past century. His Russian patriotism, he feels, is not poisoned by his fundamental dedication to the good of his local culture. His allegiance to Russia, he says, is rooted in a desire to see a more prosperous and more enlightened Dagestan. He prizes his Soviet education, and like most Russians his nostalgia pines after the Soviet Union. It would be easy for Hizri to move abroad or even to another city in Russia. He would be safer, his financial investments and risks far less shaky. Recent events have unsettled Hizri. Regular bombings and shootouts mark the ongoing Islamist insurgency. A new president has been appointed. 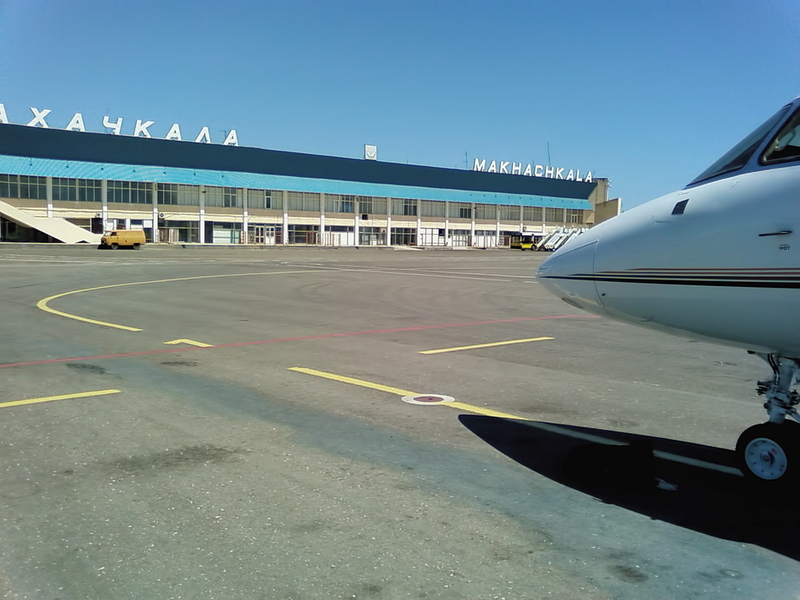 Last year, multiple platoons of spetsnaz were dispatched from Moscow with the support of tanks and helicopter gunships to arrest the mayor of Makhachkala – the mother of all Dagestani godfathers (a true one and bad one at that). A sense of duty, rather than optimism about the future, fuels Hizri’s endurance. He’s a realist, his prognostications modest and guarded. He sees his present position as an opportunity to provide needed jobs. Deeper yet, he sees his work as a chance to influence the mindset of Dagestan’s disgruntled youth. From rare art to exotic global flare to kaleidoscopic culinary novelties, his businesses aim to feed weary minds and expand narrow world views. Unlike megalomaniac godfathers who create evil empires on the bones of their enemies, Hizri is busy constructing a civilized and more globalized Dagestan. His is a growing empire of genuine prosperity, opportunity, and diversity. There are real risks, though. Islamist insurgents target establishments that sell alcohol. Crooked barons racketeer and harass. Temptations abound to preserve personal gains and safety by moving far away. The biggest turning point in Hizri’s journey took place ten years ago. Hizri had joined a group of fellow up-and-coming magnates for a business lunch. Pots of steaming black tea washed down mouthfuls of mutton. It was there, in the dark, hazy interior of a tony, downtown teahouse, that Hizri’s hazel eyes saw clearly what was happening to him. In an instant, he caught a glimpse of what he was turning in to: thousand-dollar neck-ties, group narcissism, shady deals, greed. It made him sick. He stood up abruptly and removed his tie, which had begun to feel like a noose. He left the young lamb glistening on the porcelain dish. Without speaking a word, he turned his back to the table and left these former colleagues forever. Hizri’s resolve to stay in Dagestan remains a costly one. Not only are there true mafia bosses to contend with there are also general threats like kidnapping that his growing fortune exposes him to in a place like this. It’s emotionally difficult for him to concede such constant and severe intrusions for the sake of security. When he assesses the greatest challenges to his future, loss of privacy nearly matches fear for his life. Assuring me it’s not flattery, Ramazan rushes to compare Hizri with former bosses. Hands down, he says, Hizri wins. He’s a perfectionist, Ramazan admits, but he’s also patient to a fault. It’s a well-known fact, he goes on, that Hizri doesn’t need all his hundreds of present employees; he could get by with far fewer. He pays above average. He contributes generously to school renovations, road construction projects, cultural events. The air was thick with doubt. I wasn’t buying it. But without a shred of cross-examination, Ramazan whipped out of his wallet a 1,000 Ruble note ($30) and thrust it into the poor woman’s hand. The woman’s wet face lifted upwards. She invoked loud blessings from Allah upon us and upon our children’s children. I was tempted to chalk up Ramazan’s charity to a publicity stunt. One thing was certain: Ramazan was not bothered by the threat of a beggar taking advantage of him. He preferred, even hastened, to err on the side of charity. In that way he had done his boss proud. In that way, Ramazan – and dozens of other young men like him – may just turn out to be Hizri’s greatest legacy.